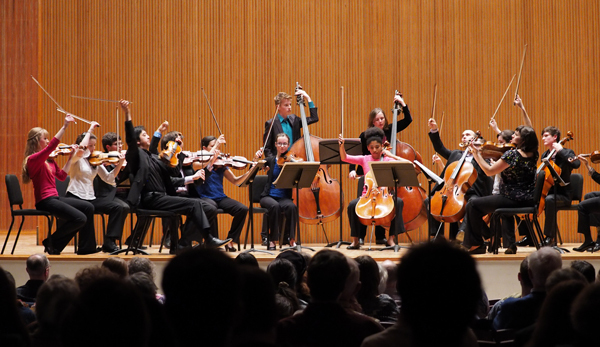 On January 25, Oberlin Conservatory’s String Quartet Gala Concert, the biggest event of its month-long String Quartet Intensive and Festival, drew an exceptionally large crowd to Warner Concert Hall despite the cold and snow. 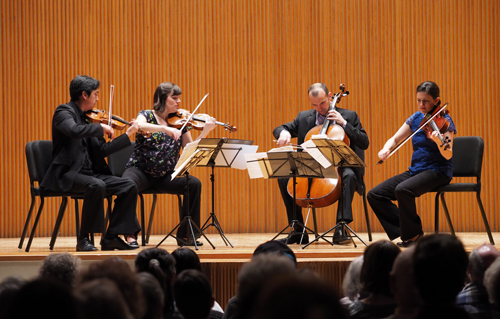 The program featured Oberlin’s quartet-in-residence, the excellent Jupiter String Quartet; Timothy Lees, the concertmaster of the Cincinnati Symphony Orchestra; Oberlin faculty; and the students who participated in the Festival. That’s an awful lot of performers for chamber music, and as the night progressed, the ensemble size grew from four to eighteen. Conversely, the music grew older, beginning with a work from the twenty-first century and ending in the nineteenth. The Jupiter, consisting of violinists Nelson Lee and Megan Freivogel, violist Liz Freivogel, and cellist Daniel McDonough, opened the night with Dan Visconti’s Ramshackle Songs, written for them in 2009. Visconti’s music is conspicuously American, containing elements of the blues, fiddling songs, and feedback from rock. Ramshackle Songs shatters Tin Pan Alley-like melodies into kaleidoscopic shards enlivened by foot-stomping, bow-swishing, plucking, and ethereal effects. The Jupiter created a coherent whole out of Visconti’s patchwork, sweetly singing innocent tunes, manically sawing away at barn dances, and blossoming in full, melodious strains. The novel ending, where McDonough pointed out in remarks that the music slows down and detunes like a record player spinning out, was just one smile-inducing moment. Yet despite the Jupiter’s best efforts, the fragmentary work overstays its welcome. There’s only so much sustained stop-and-start one can handle before the attention begins to wander. Next came the twentieth century, with Max Bruch’s posthumous String Octet, for which Lees and Oberlin faculty (violinist Marilyn Mcdonald, violist Michael Strauss, and bassist Tracy Rowell) joined the Jupiter. The work, which the performers will record, is a rather unmemorable piece of German Romanticism, despite being written in 1920. Less chamber music and more soloist with accompaniment, it lacks the intricate interplay of most string quartets. Lees presented most of the material as the first violinist while the rest of the ensemble provided harmonic stability. Motives occasionally passed from first violin to viola to cello, but Lees’s flashy part remains the fixation. The heroic first movement leads to a solemn lament in the second, whose journey from tranquility through exuberance into restfulness was richly painted by the ensemble. The piece ends with a sprightly and active finale. All of the students participating in the Festival took the stage with the Jupiter after intermission, a quartet expanded into an orchestra with two additional bassists. After seeing the student quartets perform throughout the month, it was pleasant to see them joining role models on stage. The group gave a hair-raising performance of Schubert’s “Death and the Maiden” Quartet, in an arrangement by Mahler. The extra strings beefed up the tempestuous quartet to an epic scale, packing the sepulchral chords and lightning runs with oomph. The celebratory night was a satisfying apex to a month of exciting chamber music in the String Quartet Intensive and Festival, which officially concludes on Wednesday, Jan. 29 with a master class and recital by cellist Zuill Bailey. The Schubert-Mahler work was performed by the Jupiter Quartet (*), bass players Tracy Rowell (OC Faculty) & Austin Lewellen (OC sophomore) and Oberlin Conservatory students of the Winter Term String Quartet Intensive and Festival. Complete roster: Violin I: Nelson Lee*, Nathaniel Cornell, Dorisiya Yosifova, Christa Cole. Violin II: Meg Freivogel*, Sophia Burnitz, Julian Sawhill, Lyly Li. Viola: Liz Freivogel* ’00, Natalia Badziak, Thomas Cooper, Matthew Weathers. Cello: Daniel McDonough*, Angelique Montes, Alex Baker, Aoma Caldwell. Bass: Tracy Rowell, Austin Lewellen.